PhosphoBLOCKER™ Blocking Reagent | Cell Biolabs, Inc. Most commercially available Western blot blockers, such as dry milk or serum, are sufficient to block unreactive sites on the membrane. However, they are not designed to preserve phosphoprotein antigens during blotting. Our PhosphoBLOCKER™ Blocking Reagent provides superior blocking by maximizing signal-to-noise ratio. The PhosphoBLOCKER™ reagent particluarly excels with very low levels of endogenous phopsphoproteins. Figure 1: Superior Blocking with PhosphoBLOCKER™ Blocking Reagent. 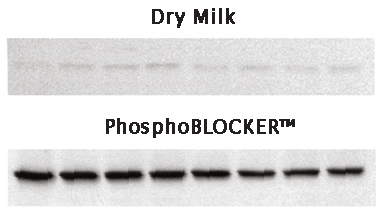 A549 cell lysate was blocked with dry milk (top) or PhosphoBLOCKER™ reagent (bottom) before detection with anti-Phospho-p38 antibody. Tisdale, E.J. et al. (2016). GAPDH binds Akt to facilitate cargo transport in the early secretory pathway. Exp. Cell Res. 349:310-319. Barkan, D.T. et al. (2016). Clustering of disulfide-rich peptides provides scaffolds for hit discovery by phage display: application to interleukin-23. BMC Bioinform. 17:481. Hirozane, T. et al. (2016). Conditional abrogation of Atm in osteoclasts extends osteoclast lifespan and results in reduced bone mass. Sci Rep. doi:10.1038/srep34426. Treda, C. et al. (2016). EGFR activation leads to cell death independent of PI3K/AKT/mTOR in an AD293 cell line. PLoS One. 11:e0155230. Ye, J. X. et al. (2016). The suppression of PGC-1α is associated with hypoxia-induced endothelial dysfunction and provides a new therapeutic target in pulmonary arterial hypertension. Am J Physiol Lung Cell Mol Physiol. doi:10.1152/ajplung.00356.2015. Fukuda, S. et al. (2016). Reversible interconversion and maintenance of mammary epithelial cell characteristics by the ligand-regulated EGFR system. Sci Rep.doi:10.1038/srep20209. Shinoda, K. et al. (2015). Pin1 facilitates NF-κB activation and promotes tumour progression in human hepatocellular carcinoma. Br J Cancer. doi: 10.1038/bjc.2015.272. Kuroda, Y. et al. (2015). Suppressive effect of membrane-permeable peptides derived from autophosphorylation sites of the IGF-1 receptor on breast cancer cells. Eur J Pharmacol. doi:10.1016/j.ejphar.2015.08.004. Matsushima, M. et al. (2015). Intravesical dual PI3K/mTOR complex 1/2 inhibitor NVP-BEZ235 therapy in an orthotopic bladder cancer model. Int J Oncol. doi: 10.3892/ijo.2015.2995. Obis, T. et al. (2015). The novel protein kinase C epsilon isoform at the adult neuromuscular synapse: location, regulation by synaptic activity-dependent muscle contraction through TrkB signaling and coupling to ACh release. Molecular Brain. 8:8. Bemben, M. A. et al. (2015). Autism-associated mutation inhibits protein kinase C-mediated neuroligin-4X enhancement of excitatory synapses. Proc Natl Acad Sci U S A. 112:2551-2556. F. de Castro, L. et al. (2015). VEGF receptor 2 (VEGFR2) activation is essential for osteocyte survival induced by mechanotransduction. J Cell Physiol. 230:278-285. Ohba, K. et al. (2014). Expression of (pro) renin receptor in breast cancers and its effect on cancer cell proliferation. Biomedical Res. 35:117-126. Shimura, T. et al. (2014). AKT-mediated enhanced aerobic glycolysis causes acquired radioresistance by human tumor cells. Radiother Oncol. 112:302-307. Shimura, T. et al. (2014). DNA damage signaling guards against perturbation of cyclin D1 expression triggered by low-dose long-term fractionated radiation. Oncogenesis. 3:e132. Inserte, J. et al. (2014). Delayed phospholamban phosphorylation in post-conditioned heart favours Ca2+ normalization and contributes to protection. Cardiovasc Res. 103:542-553. Lan, F. et al. (2014). LECT2 Functions as a Hepatokine That Links Obesity to Skeletal Muscle Insulin Resistance. Diabetes. 63:1649-1664. Nakamura, Y. et al. (2014). Oligomerization-induced conformational change in the C-terminal region of Nel-like molecule 1 (NELL1) protein is necessary for the efficient mediation of murine MC3T3-E1 cell adhesion and spreading. J. Biol. Chem. 289:9781-9794. Marques, J. et al. (2013). CRMP2 Tethers Kainate Receptor Activity to Cytoskeleton Dynamics during Neuronal Maturation. J. Neurosci. 33:18298-18310. Ferreira, E. et al. (2013). Inflammatory Cytokines Induce a Unique Mineralizing Phenotype in Mesenchymal Stem Cells Derived from Human Bone Marrow. J. Biol. Chem. 288:29550-29561. Inserte, J. et al. (2013). Activation of cGMP/Protein Kinase G Pathway in Postconditioned Myocardium Depends on Reduced Oxidative Stress and Preserved Endothelial Nitric Oxide Synthase Coupling. JAHA. 2:e005975. Ishii, K. et al. (2012). Serratia marcescens Induces Apoptotic Cell Death in Host Immune Cells via a Lipopolysaccharide- and Flagella-dependent Mechanism. J. Biol. Chem. 287: 36582-36592. Rosich, L. et al. (2012). Counteracting Autophagy Overcomes Resistance to Everolimus in Mantle Cell Lymphoma. Clin. Cancer Res. 18: 5278-5289. Naraoka, T. et al. (2012). Time-Dependent Gene Expression and Immunohistochemical Analysis Ofthe Injured Anterior Cruciate Ligament. Bone and Joint Res. 1: 238-244. Martinez, P. et al. (2012). 53BP1 Deficiency Combined with Telomere Dysfunction Activates ATR-Dependent DNA Damage Response. J.Cell.Biol. 197:283-300. Ishii, K. et al. (2010). Insect Cytokine Paralytic Peptide (PP) Induces Cellular and Humoral Immune Responses in the Silkworm Bombyx mori. J. Biol. Chem. 285:28635-28642. Song, A. et al. (2010). A C. Elegans eIF4E-Family Member Upregulates Translation at Elevated Temperatures of MRNAs Encoding MSH-5 and Other Meiotic Crossover Proteins. J.Cell Sci. 123:2228-2237. Ramakrishnan, R. et al. (2009). Characterization of Cdk9 T-Loop Phosphorylation in Resting and Activated CD4+ T Lymphocytes. J. Leukoc. Biol. 86:1345-1350.